2011 EDITION - Fully updated throughout. 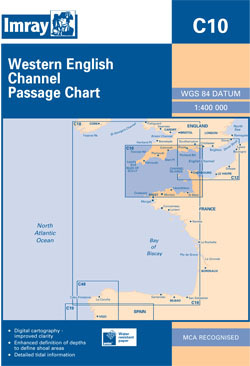 The western part of the English Channel from the Scilly Is and Ouessant to the Isle of Wight and the Cherbourg peninsula in the east. Five-minute gridlines. Scale: 1 : 401.000. Good passage chart. For this 2014 edition, the chart has been fully updated throughout, using revised depth data where applicable.